Description: A systematic introduction to science designed primarily for grades 8th - 10th. Topics include the atmosphere, the hydrosphere, weather, the structure of the earth, environmentalism, and physics of motion, Newton's Laws, gravity, and astrophysics. Lab experiments, application problems and tests included. Students must keep up with reading and homework in order to fully comprehend the material and to be prepared for lectures, class discussions and experiments. Tutor: Laura Glassel grew up in the New England area, Germany, and Minnesota. She received her associate's degree in Aircraft Maintenance, her bachelor's degree in Missionary Aviation, and her master's degree in Bible Translation from Bob Jones University. As part of her education, she earned both her aircraft mechanic's and pilot's certificates. During her college years, she tutored high school students, and learned a lot about teaching techniques and learning. She has since been able to transfer her tutoring skills to the classroom situation in order to share her passion for learning with more students. 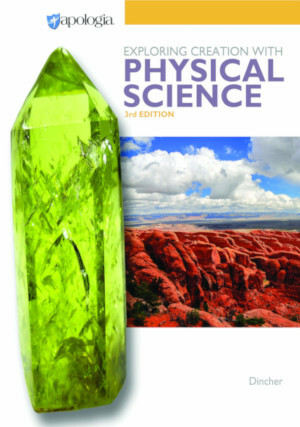 Text: (To be purchased by parents) Exploring Creation with Physical Science, 2nd Edition, by Dr. Jay Wile, (text MUST be 2nd edition). Apologia 1-888-524-4724 or www.apologia.com.